Wisdom for Living a Balanced Life. A beautifully clear and accessible explanation of how to live a Taoist life--by reknowned Taoist master Eva Wong. Being Taoist is one of the most readable books on Taoist philosophy available. 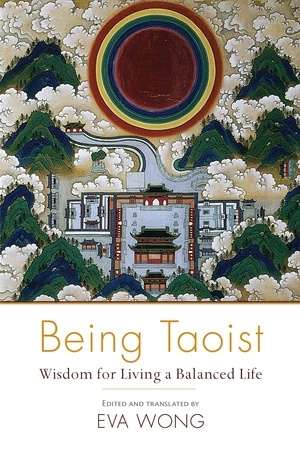 It shines a light on exactly what it takes to live a Taoist life. Taoist living rests on four pillars--the public, the domestic, the private, and the spirit lives. Not only do Taoists strive to live these four aspects fully and in a balanced way, they also believe there is an outlook and an art to each of them. Eva Wong uses the teachings of Taoist masters (one for each pillar) to explain the essential concepts. She then gives voice to these texts--simplifying them, removing barriers to understanding, and making them completely accessible and relevant to the modern reader. Wong is a clear and enthusiastic guide to this intriguing spiritual Way, and she challenges us to stop, reflect, and ask ourselves: Do we balance the public, domestic, private, and spirit aspects in our lives? Do we emphasize some at the expense of the others? Do we ever think about unifying worldly and spiritual wisdom in our lives?